This is a whale of a tale about a butcher who yearns to be a fish and turns into a salmon. It inspires LeVar to go on an exploration of exotic marine life, tide pools and dolphins while he explains that pretending to be someone else can be exciting and also a way of discovering how wonderful it is to be yourself. LeVar visits the New England Aquarium in Boston, MA, and the Aqua Circus of Cape Cod where trained dolphins Dixie and Dolly reside. The Mysteries of Dinosaurs - LeVar buries a time capsule and relates this activity to what we find now when we look at dinosaurs from the past. What Makes a Dinosaur? - Dino-history poem with visuals of present day animals who are related to dinosaurs. 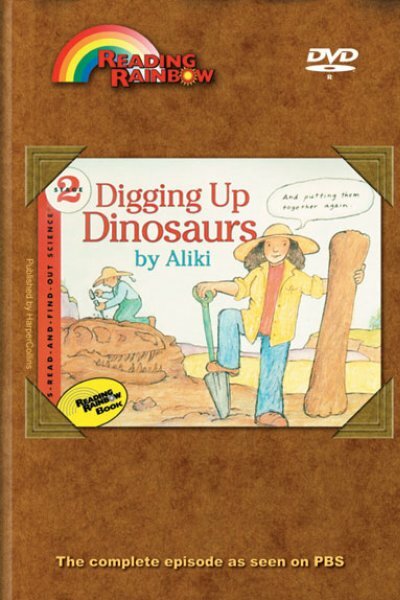 Let's Dig Up Fossils - LeVar visits the Dinosaur National Monument where dinosaur fossils are dug. Linda, a ranger and Toby, a paleontologist, tell about dinosaur fossils and show LeVar what work they do at the park. Book Reviews: Dinosaur Time by Peggy Parish; If You are a Hunter of Fossils by Byrd Baylor; Dinosaurs! A Drawing Book by Michael Emberly. Math matrix - Math Episodes. Social Studies Matrix - Social Studies Episodes. Use this episode to further enhance your maath and science curriculum. Science Concepts: how fish breath, importance of oxygen, movement in water density. Rights granted with purchase include: a) life of media audiovisual use and b) public performance..